One of the many invasive weeds on the block - Kudzu. and shrubs and smothers their further development. Int the past years, the Kedron Brook Catchment Branch of the Wildlife Preservation Society of Queensland prepared an educational program on catchments and ecological monitoring. The program was tailored to schools within the water catchment of Kedron Brook and was first introduced to some schools in 2007. An experienced educator and a biologist prepared the two hour hands-on environmental science program. The classroom component was facilitated either by the (then) Kedron Brook Creek Ranger, a KBCB educator, or the teacher, while the outdoor activities are facilitated by educators with experience in waterway monitoring. Go to our webpage on education in our projects section for more information. 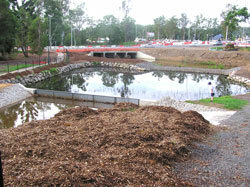 Most of our website sections have useful information about Kedron Brook and more broadly catchment management. These are readily linked via the navigation bar just under the top banner. Look particularly at 'Bushcare Groups', 'Kedron Brook Environment', 'References', 'Educational Resources', and 'Projects'. Our 'News and Events" section gives access to a range of specific subjects. This latter section also links to archives of KBCB-WPSQ Newsletters from the 'Downloads' sub-section. The following specific links point to a range of references and guidelines about Kedron Brook and catchment management in general. You'll also find the search box above most useful to poke around on this website. Don't forget that this search box is set to find keywords exclusively on this website alone! Note that the order of located links to be found by this process is not necessarily in that of most relevance to you. Skim through while reading the brief descriptions for their relevance. Do play around with the use of different combinations of keywords in your searches. Moreton Bay Regional Council (MBRC) Remember that although most of Kedron Brook is within Brisbane City Council (BCC) area, this council controls and nurtures a significant portion in the upper reaches of the stream. Their website has particularly useful information in their 'Environment' section. Men of the Trees (QLD) Inc (MOTT) is a non profit, non political, international society dedicated to fostering a tree sense, and the planting, maintenance and protection of trees. The organisation works in both BCC and MBRC areas and in other catchments than Kedron Brook. They have been working often within Kedron Brook catchment; specifically at Cedar Creek (eastwards from Arbor Park), Bob Cassimaty Picnic Grounds and Keperra Picnic Grounds, all within Ferny Grove, and at Thomsett Park in Ferny Hills. An article by Andrew Burrows gives additional information to that on our MOTT website that covers these areas. MOTT also maintains a site at Thomsett Park off Olakuna Cresent, Ferny Hills. 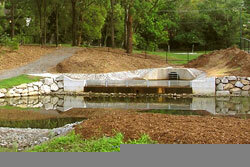 Kedron Brook, its history, development, flora and fauna, and catchment management. Know your creek - Kedron Brook This is the Brisbane City Council (BCC) special brochure about our Brook including understanding catchments and waterways. It also gives a useful section on the past influences of the aborigines followed by the European settlement. Kedron Brook Fauna Habitat Study This links to our detailed report on the Brook by Dr. Seonaid Melville. Remember the title says 'Fauna Habitat' so the report will say a lot about the conditions and suitability of their environment as well as the fauna. This report informs and it is still relevant up to this day! Enoggera & Districts Historical Society Inc is a non-profit organisation helping the local community discover it's history. In particular, their publication, 'Between Kedron Brook and Taylor Range-Historical aspects of seven suburbs', 2004, gives information about Kedron Brook, military influences on the district, institutions and communications, primary industries and Iindustrial firms, recreations, sport and eminent people from the past. The website seems to be frozen at 2002 but serves as initial contact to the present organisation at Enoggera Memorial Hall. Brisbane City Council – Environmental garden Plants, trees and gardens (Green choice gardening) appropriate to an urban catchment. Brisbane City Council - Environment and waste Towards zero waste by recycling, reducing energy waste and less down our creek!. Brisbane City Council - Habitat Brisbane The program of assistance given to specific community bushcare groups along catchments. Waterwatch is a national community water quality monitoring network that encourages all Australians to become active in the protection of their waterways. A very practical site in the provision of suitable resources for understanding and application. Ferny Grove State High Fish Snapshot Day A visual example of the conduct of a typical Fish Snapshot; a water quality study, based upon Waterwatch methods, as carried out by students of Kedron Brook SHS some years ago but still relevant. The water quality measurements (Fish Snapshots) taken at selected points along the Kedron Brook over the period 2002-2009 is available in a Powerpoint summary report (657 KB pdf file). Environmental inquiry is a website that provides ideas for running inquiry based investigations in science. The Healthy Waterways Education section of South East Queensland Healthy Waterways gives a specific slant on our environment relating to land use as well as to such factors as biodiversity and climate change but also deals with waterways, marine and coastal concerns. The South East Queensland Healthy Waterways is a collaboration between government, industry, researchers and the community. This website covers a comprehensive compilation of important facts on water with a particular focus on South East Qld. It also provides useful links relating to water education in general. Try another of their websites, 'Water by design'. Look particularly at their 'Guidelines and Resources' section including useful factsheets and a huge resource, 'Concept design guidelines for water sensitive urban design (WSUD)' . This useful resource from BCC shows watercourses, streets, properties and parklands. In particular, it shows overland flow paths and where flooding may occur from creeks, rivers and storm tides. See also the Floodwise Property Report. Essential Guide to Flood Preparation and Planning A useful guide from United Kingdom. Disaster Safety Library An American Red Cross contribution to handling huge disasters. Planning and Building Rules Covers Brisbane City Council requirements to manage growth and change in Brisbane, and thus our catchment. The Sustainable Planning Act 2009 is the Queensland legislation that is providing the push behind the improvement of water quality in developing urban areas as examplified in the next link. Natural Environment details Brisbane City Council's general approach. Use the search box top right of each web page to find various documents under the headings of 'Plants, trees and gardens', 'Bushlands,parklands and wetlands', 'Protecting wildlife in Brisbane', 'Brisbane's creeks and rivers', 'Environment centres', and 'Weeds'. Cleanup Australia Points out the problems of mislaid wastes and a way of helping to clean up the mess. Conduct a separate Google search on 'shopping trolleys' for an individual look at new, used, mislaid and abandoned trolleys. The River Styles Management Framework This website introduces a geomorphic approach for examining river character, behaviour, condition and recovery potential. This provides a physical template for river management. Useful concepts to compare the Brook's behavioural patterns from source to the Bay. Queensland Government - Dept. of Environment and Heritage Protection, land and water management. A valuable resource for studying wildlife and ecosystems, coastal management, monitoring, management and regulation, and links to other resources such as fact and information sheets. Caboolture- Large scale Wetland Information Map (9.5 MB file) Interesting but though it covers most of Brook it is at too small a scale for much use. About Weeds This web page gives a general introduction to the subject with emphasis on how weeds affect the Brook. Weeds - Brisbane City Council This is the Brisbane City Council's website covering weeds, their cost, identification, weed control methods, pest plant species declared by the State, and by the Council, weed-related links, how weeds affect our wildlife, weed fact sheets and the Brisbane Invasive Species Managment Plan. Environment - Moreton Bay Regional Council This website has important information about the environment and particularly useful for information about weed on their 'Environmental pests and weeds page'. Queensland Department A launch home page to a host of information but also includes the useful Environment, land and water It is particularly useful for information on weeds relevant to Queensland. Plants and animals has usefulinformation on the subject..
Weeds in Australia - Australian Government A website jointly administered for a number of relevant Australian Government departments. Includes a discussion of what constitutes a weed, problems caused by weeds, weed identification (database and images), weed prevention, early detection and eradication, National weeds list. A useful weed identification tool. See also Non-native plants and weeds. James Cook University North Queensland This website gives a more botanical look at northern Queensland weeds; many of which are to be found in SE Queensland. also guides on animals, fungi and similar resources. Dyschoriste and Camphor laurel weeds in Kedron Brook This is a short report about two different types of invasive weeds along the Brook. Kedron Brook Catchment Weed Project Report This is a mammoth detailed study of weed invasion in some vital forest remnants along Kedron Brook (2005-2006) by Nathan Kirby. Transition The Grove Interesting website with the aim of involving local communities within the upper Kedron Brook valley in ways of improving our environment.